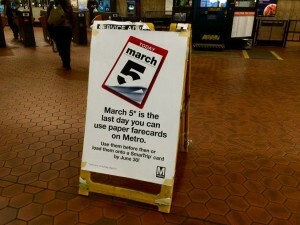 This is the last week the Metro system will accept paper farecards. Starting Sunday at 7 a.m., Metro will stop accepting the paper cards at turnstiles and will only accept SmarTrip cards. It’s one of the final steps in Metro’s phasing out of paper farecards, which the agency stopped selling Dec. 31, 2015. The very last step will happen this summer, when Metro stops accepting paper cards as trade-ins. “If you still have a paper farecard or a Metrochek after June 30, 2016, congratulations, you have a Metro souvenir,” Metro said on its website. In addition to online reminders, signs have been placed in local Metro stations informing riders of the changes.